Porches are small extensions that are normally attached to the front of a house, although they can be much larger and typically can be very popular to the side or to the rear. 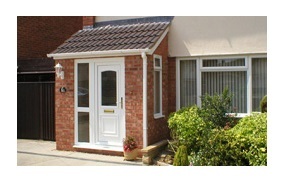 This type of extension provides you, and allows for, sufficient space for a person to comfortably change there footwear or hang a coat out of all adverse weather conditions, helping to prevent people and children from bringing the outside inside. At Plan and Design we think porches are amazing areas, we will design the perfect area which adds appeal and character to your house. Porches are ideal areas for shoes, coats, hats and gloves. These are everyday items we use when venturing outside and therefore serve a very convenient place to store them. For cost effective and fast porch designs or drawings across the Lancaster & Morecambe areas, or to find out more information about our services and designs, please contact us today.